CowBoy leather sewing machines, leather cutting machines & leather crafting tools are widely used by American and Australian saddle makers, harness makers and handmade leather workshop. Cowboy leather sewing machines are available in flat bed, post bed, feed-up-the arm, long arm, cylinder arm models, covering all types of industrial sewing operations. These leather sewing machines come with a full array of sewing attachments designed by saddle makers and leather crafter who has over 40 years of saddle making experience. CowBoy leather sewing machines and leather crafting tools have been in selling in United States, Australia, Canada, Germany, France, Italy, UK, Spain, Ukraine, Russia and South Africa since 2000. Our strong point is to realize customized solutions and we are able to offer the most suitable products for the highest possible productivity and seam quality. OUTLAW Hand Stitcher Leather Sewing Machine(US PATENT APPROVED): The Cowboy Outlaw hand operated leather stitcher is the finest machine of its type in the market today. Carrying on the legacy of fine hand craftsmanship that defined the American West, the Cowboy Outlaw hand stitcher has proven itself to be an indispensable tool to leather workers the world over. Each pull of the handle delivers a clean, precise lockstitch, allowing the operator total control of stitch placement. The Outlaw uses some of the heaviest thread available allowing the user to create finely handcrafted leather items of true distinction and character. The Cowboy Outlaw hand stitcher makes sewing easy for the experienced craftsman, or the novice alike. It is an ideal machine for those looking for an alternative to tedious and time consuming hand stitching. Cowboy CB3200 Heavy Leather Sewing Machine (US PATENT APPROVED): the lowest cost heavy-duty compound feed walking foot machine for sewing saddles and harness available on the market today. Cowboy CB3200 leather stitcher is capable of sewing up to 1/2" of saddle leather, with up to #415 bonded nylon or polyester thread, ideal for sewing belts, collars, tack, holsters, cases and saddle bags. CowBoy CB3500 Heavy duty triple feed leather sewing machine for saddle maker and leather worker: the compact design is ideal for small leather workshop and Saddler's workshop; The extra powerful servo motor allows for one stitch at a time sewing by leather workers or anyone who needs stitch by stitch control for small items and turning corners; This leather stitching machine has over 20 special sewing attachments that meet most individual sewing requirements of saddle makers, harness makers and leather craftsmen. Cowboy CB4500 Heavy Duty Leather Sewing Machine for stitching saddle and harness: The Cowboy CB4500 is our number one selling heavy duty harness stitcher. This machine has become the standard in the saddle and harness industry. It has been widely used for stitching bullet loops, saddle skirts, headstalls, halters, breatstcollars, holsters, knife sheaths, chaps, knee pads, covered stirrups, gun belts, cases and other leather craft. The machine can also be used to stitch luggage, suitcases, heavy hand bags, heavy textile products, briefcases, and the like. Cowboy 205-370 Premium heavy duty leather sewing machine for saddle makers, leather workers and manufacturers of harnesses (---sew saddles, harness and horse tack bettern than any other stitching machine built today): Based on a popular German design and German engineering, these machines are an excellent choice for those persons seeking a technologically advanced sewing machine for sewing leather, nylon webbing, heavy canvas, beta and biothane webbing, as well as various coated and laminated products. Cowboy CB105 Simple and cheap Leather Sewing Machine: this cheap leather sewing machine is ideal for stitching saddlery, leather and bioplastic harnesses and bridles, gun holsters, ammo pouches, gun belts, weight belts, nylon webbing tow ropes, animal collars and leashes. Very easy to use. This industrial leather stitcher is similar with Adler 105 and Singer 45K, but with reverse stitch. Cowboy CB341 medium weight walking foot cylinder arm sewing machine: The Cowboy CB341 is an ideal machine for lightweight and medium weight fabric and leather sewing projects, for example wallets, chaps, chinks, belts, billfolds, purses, handbags, automotive upholstery, marine vinyl and canvas, and other lightweight and medium weight projects. 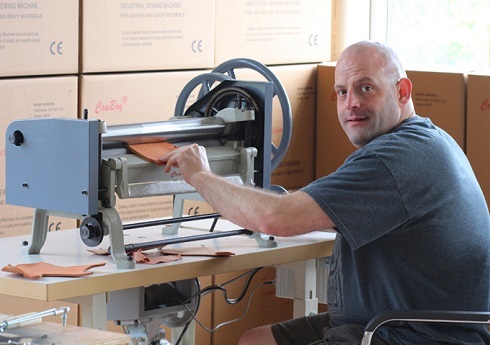 806 Craftool leather splitter : The CB-806 leather splitting and skiving machine is an excellent choice for the leatherworker on a budget that requires a very sharp, efficient leather splitting machine for doing a multitude of leather splitting operations around the workshop. This feature is normally found on leather splitters costing much more money. 807 Economical and practical leather paring device: This is popular, essential and easy to use piece of hand craft tool for leather workers and bookbinders. 809 Leather paring machine: It is easily adjustable for the thickness and angle desired. It allows the paring of leather to become a simple routine. Edge-paring and corners are a 'breeze' to undertake and as it is also so precise, preparing onlays and inlays become easy tasks. 8116 Hand crank leather splitting machine:The Cowboy 8116 series hand crank machine is the ultimate bench mounted splitting solution for doing level splits on very heavy and thick leathers. Split 4 ounce thin leather down to two ounce easily. The gear driven bottom feeder and long crank handle affords the user the highest degree of mechanical advantage when splitting thick and tough leather hides, belts, and soles of shoes. The machine can split leather, rubber, crepe, and other natural and man made leather products with ease. 8360 Manual Die Cutting Press Clicker: This bench top clicker has been used for leather, embroidery, badge cutting, card stock, magnetic cards, coasters, small plastic shapes, straps and belt ends, clothing, rubber, key fobs, cork, plastic, felt and many other materials. 8500 Rotary punch for leather belt hole: This rotary punch is built for basic repeat punching in the belt and strap trades. This labor saving unit is easy to use; adaptable to leather and even coated webbing applications. Equipped with automatic feeding and self-centering gauge that accommodates straps from 1/2 to 4-1/8 inch wide. 8020 Lowest cost leather splitting machine with for saddle leather: The Cowboy Model CB 8020 is among one of the largest stationary blade splitters ever built for use in leather shops and by leather hobbyists. The CB 8020 is rated to split approximately 15-16 inch wide pieces of leather in any length. The machine excels at splitting thick leather and works down to leather that is around 6-7 ounces thick before splitting. The micrometric thickness adjuster allows the machine to split as thin as about 1 ounce off at a time up to 12 ounces in a single pass. Cowboy 818 leather strap cutting machine: The 818 leather strap cutter represents an extraordinary value for the person desiring to engage in the bulk production of strap goods such as belts, reins, halters, headstalls, bridles, and the like. Infinitely adjustable blade spacing allows you to cut very wide and very narrow straps, and even cut varying widths of leather all in the same cut. Do you have any questions about our leather sewing machines in this area? Please contact our United States Head Sales and Distribution Office in Ohio (Ph:+1 330 6921418 or E-mail: neelre@comcast.net), thanks!